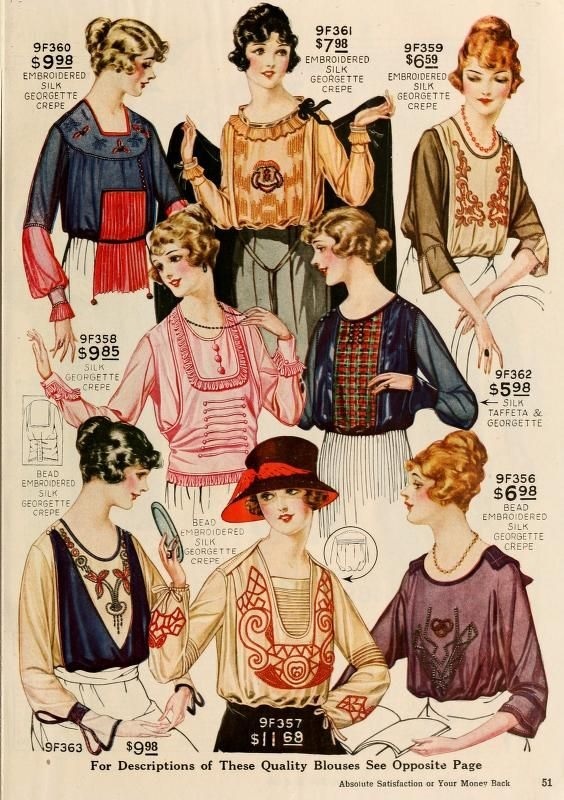 One of the milestones to fashion history came when the much loved knitwear came into being. I tried to channel the innovative qualities of both knitwear and the 20’s style in this project. 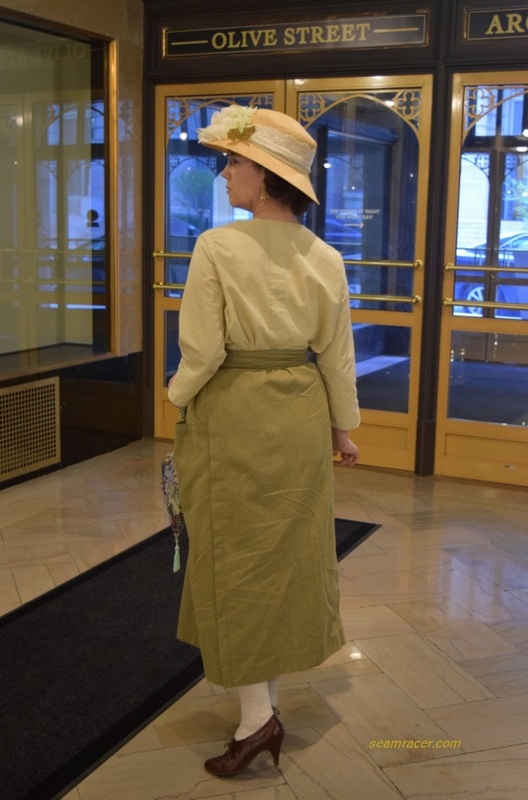 A resale store purchase of a RTW dress, with a ‘big box’ store label, was transformed into a new vintage style dress reflecting the height 1920’s fashion. 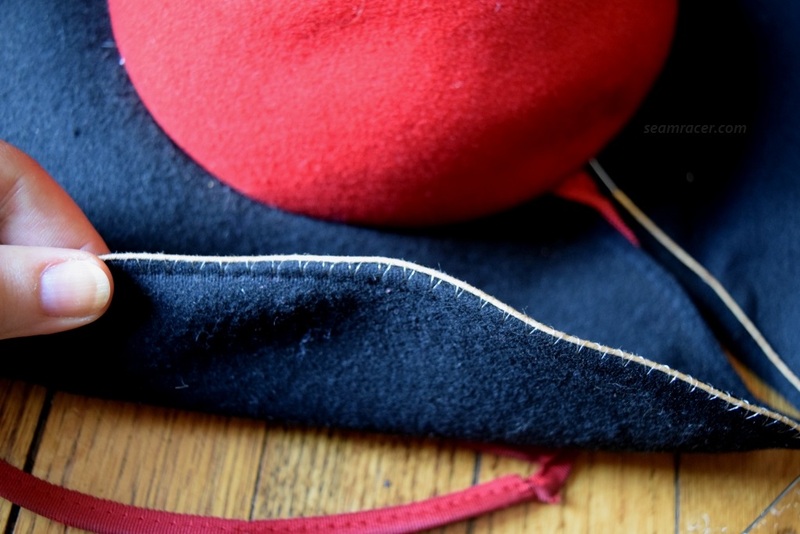 Thanks to two great personalities – Coco Chanel and Jean Patou – the populace were able to enjoy the freedom and comfort of knit fabric at an earlier date in history than many people realize. In 1916, Chanel was using jersey in her hugely influential suits for women, thereby popularizing the feminine association with knits. 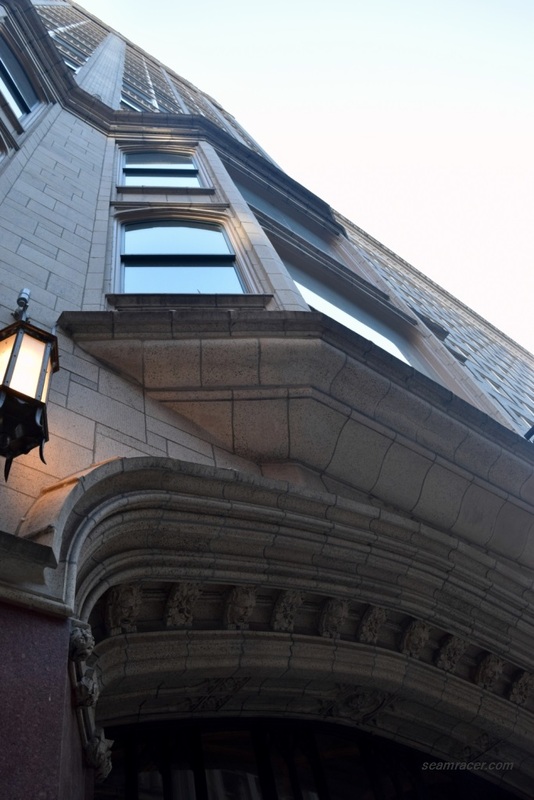 However, in 1919, French fashion designer Jean Patou, had come back from 4 years of fighting in WWI (The Great War) and re-opened his couture studio. He soon became known for designing what we know as sportswear, and is considered the inventor of the knitted swimwear and the tennis skirt. He also was the first designer to popularize the cardigan, besides being known for his cubist-inspired, color-blocked knits. 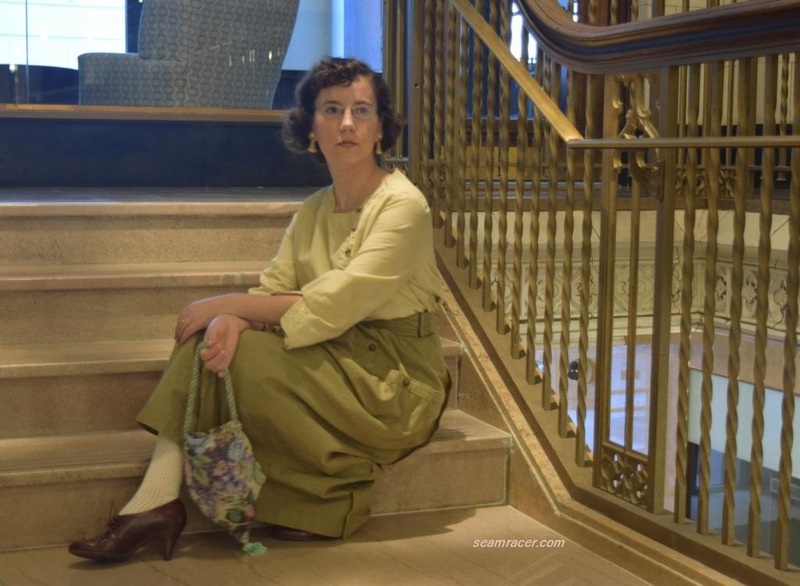 Jean Patou did wonders to move fashions towards the natural and comfortable, accommodating for the healthy and athletic lifestyle which was the “new” ideal for women starting with the ditching of constrictive corsets in the 20’s. Coco Chanel is quoted as once famously saying, “I want women to eat and laugh without fear of fainting,” and knitwear for the newly independent and working women helped achieve Chanel’s desire all the way into our modern times. 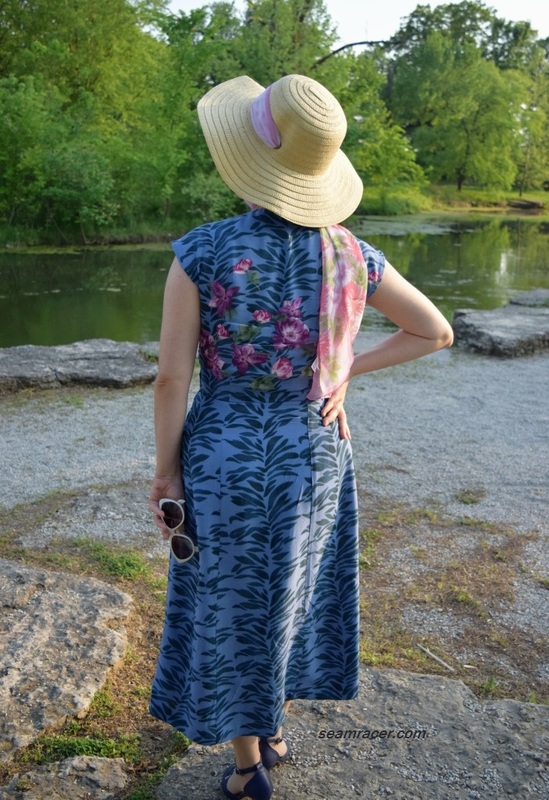 FABRIC: The main body of my shawl collar dress started out as an Old Navy item bought at a resale store (see the original dress in the picture at left). The Old Navy dress is a Modal (rayon type) knit with a small percent of polyester, and is sort of thin but very soft with a brushed feel. The fabric I bought (for the add-ons to re-fashion my dress) is a cotton/rayon knit with a small percent of spandex included. 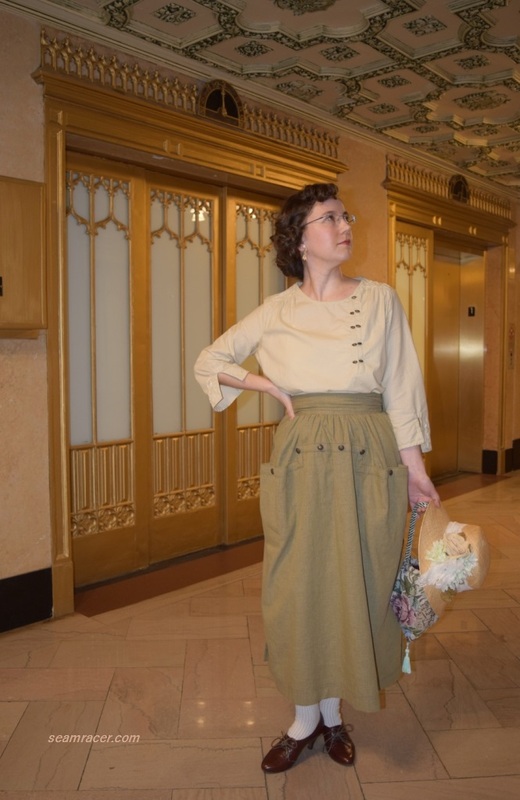 The spandex made this knit less than favorable for a historical dress, but it was the best match color wise and similar to the knit of the Old Navy dress. The shoulder bow is a rayon knit and comes from a top that was bought at Target (on clearance) about 10 years ago. The bow was taken off of the top and has been in my “bone yard of extra stuff “for a decade, waiting for the right project to finally come along! PATTERNS: 1) the Bertha/shawl collar came from view B of Vogue 8907, year 2013; 2) the longer second skirt that went under the Old Navy dress’ skirt came from Simplicity 2614, view A, year 2009; 3) the long sleeves came from an OOP Vintage Vogue #2354, view B, year 1999. NOTIONS: The only thing I bought to make my dress was one skein of “Snow” colored cross stitch floss to decorate the shawl collar. Black thread was the only other notion I used, and I always have plenty of that on hand. 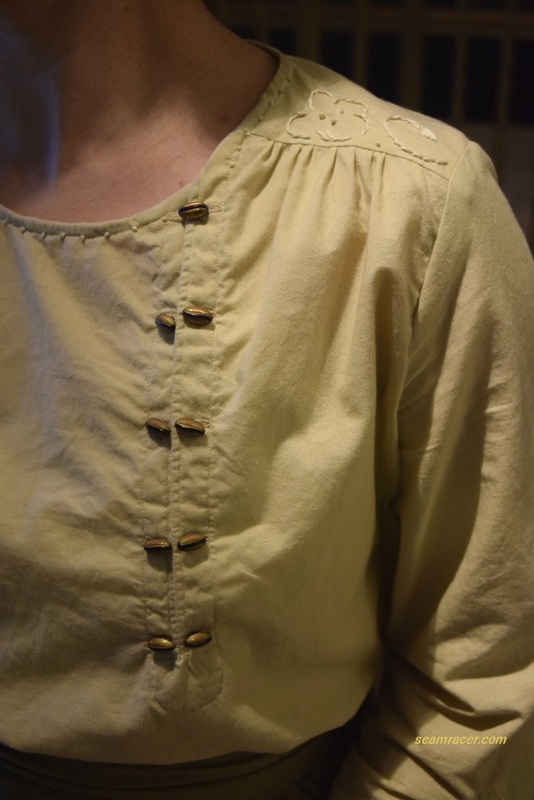 THE INSIDES: the original dress I re-fashioned had serged seams, which I left as is, except for the sleeves, of course. 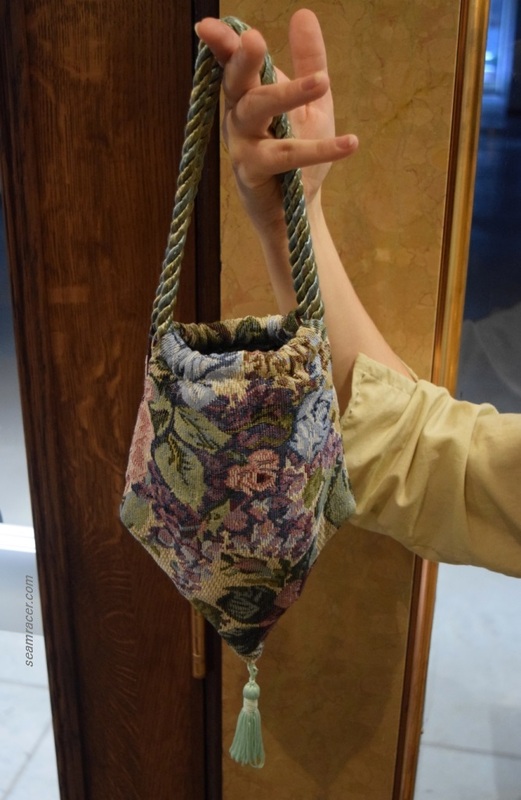 Everything I sewed was done in French seams or self-covered. TOTAL COST: I spent only $4.00 for the original Old Navy dress, and around $20.00 for the fabric to refashion it, but with only 30 cents for the skin of cross stitch floss, I figure on a total of about $25.00. HOW HISTORICALLY ACCURATE IS IT? Quite accurate in everything except the small percent of polyester, spandex, and Modal in the knits. Polyester has roots in the 1929 writings of Wallace Carothers, but it and spandex weren’t actually around ’til the 50’s. 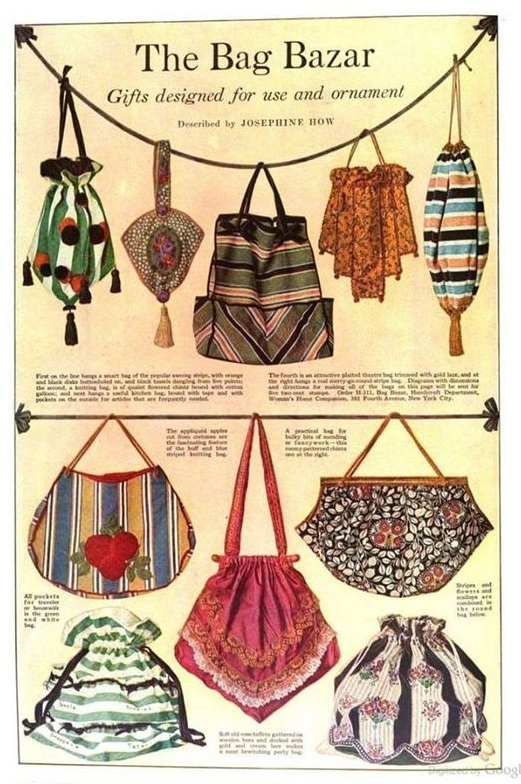 See The Dreamstress’ post on “Rayon and other manufactured naturals” for an explanation on Modal and rayon’s historical stories. 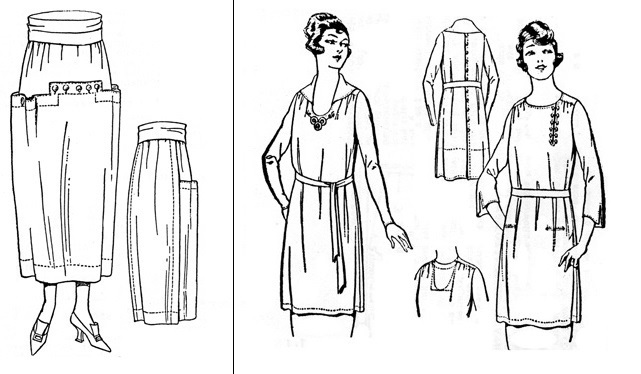 Otherwise, the dropped waist of my dress is very classic of the 20’s, as are the new skinny sleeves I sewed and added. 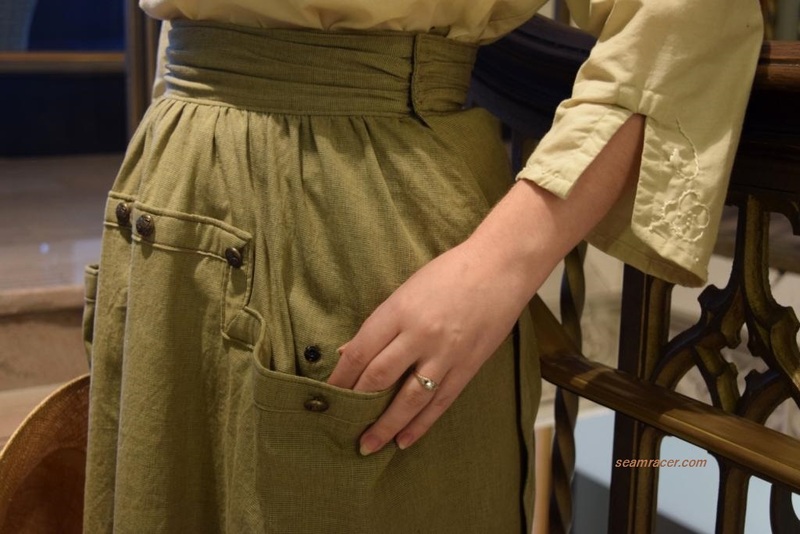 The double skirt can also be found in some 20’s patterns and posters, while the shawl collar’s accuracy has already been proved. 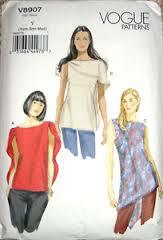 My first step towards making my 20’s dress was to cut off the too tight short sleeves and sew in my new long sleeves. 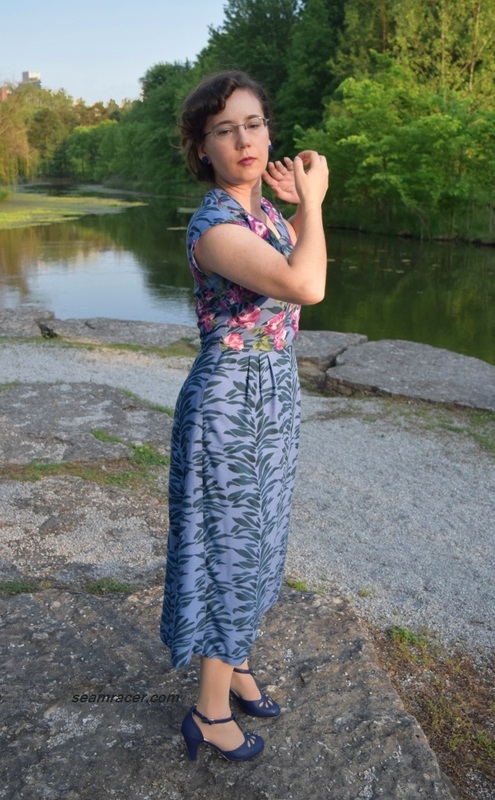 I used my Vintage Vogue 2354 mainly on account of the skinny sleeve look, but also because of my intent to sew up this 1947 dress soon for an event, and I wanted to experiment and see how they would fit. As they turned out, the VV2354 sleeves fit me great, but they are SO skinny! The part around the wrist barely stretched over the free arm of my sewing machine. I made a paper note to keep with the pattern, so when I make my VV2354 out of my satin, I will remember to hem the sleeve cuffs before I sew the sleeve length together. Next, I sewed the front and the back the two skirt pieces together for t he under skirt I was adding. 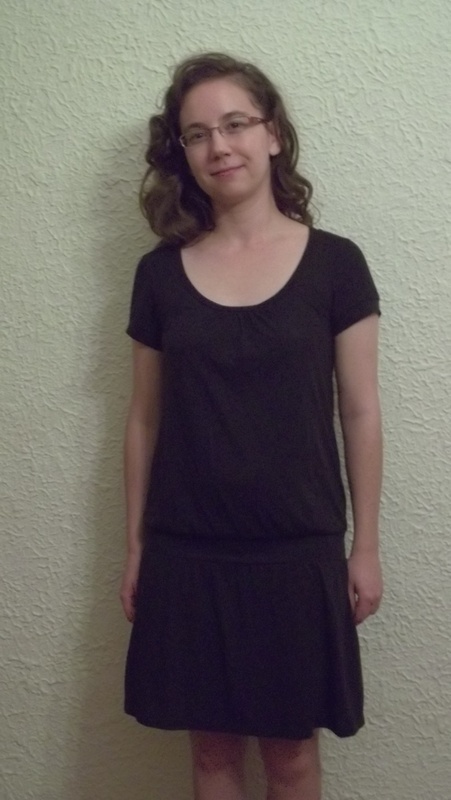 The skirt of Simplicity 2614 is cut on the bias and has a beautiful gentle flare which complimented well with the skirt on the original dress. 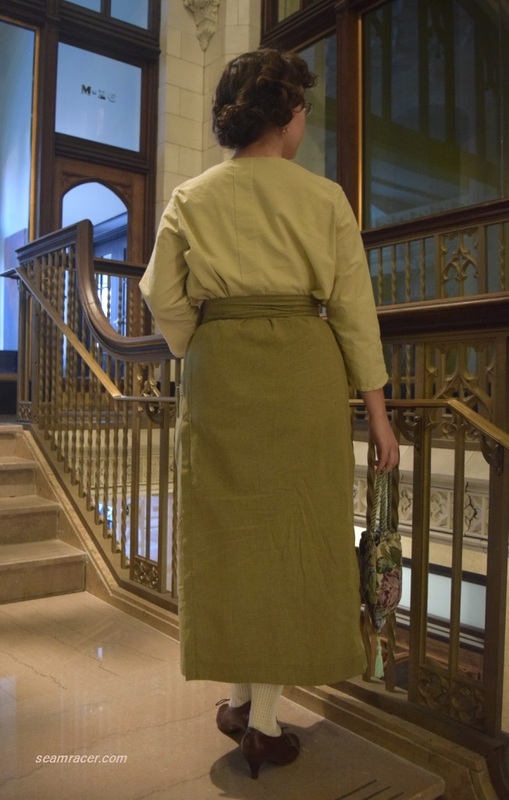 The second under skirt was added to help prevent any see-through issues, to add length, and to give my re-fashioned dress extra authenticity and character. The original pattern had to actually be shortened about 5 inches since I wanted the dress to be knee-length and, remember, the waistband is at the hips. As you can see, my dress stays at that ‘borderline-to-shocking’ length for the late 20’s – short enough to show the knees at times but also long enough to cover them too. 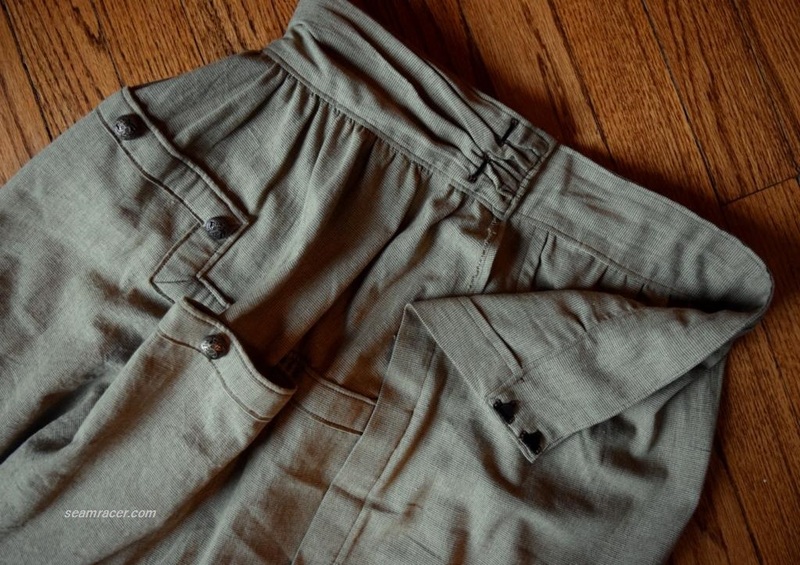 The skirt was hemmed, the top folded in onto the ‘good’ side, and pinned then sewed to the inside top of the hip waistband (see right picture). My skirt addition does wonders for the dress’ hip waistband; it is now much more sturdy and it doesn’t roll or bunch up like it did without the second skirt underneath. 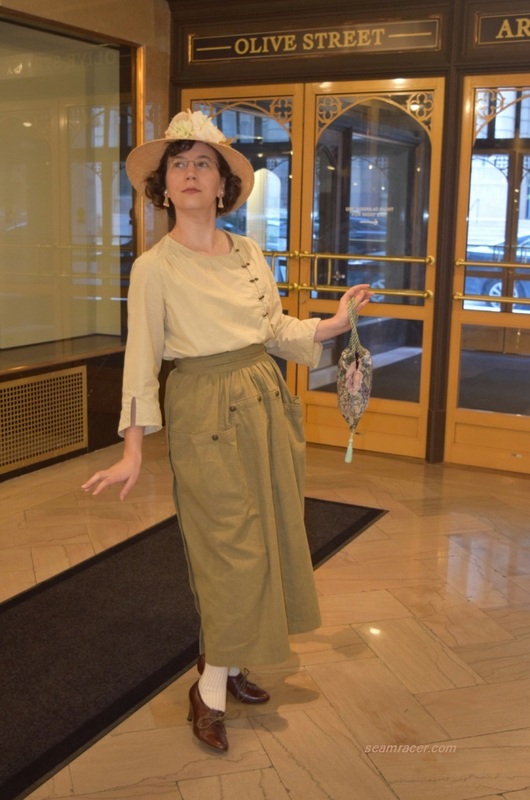 You bet I’m wearing my handmade 1920’s tap pants underneath! 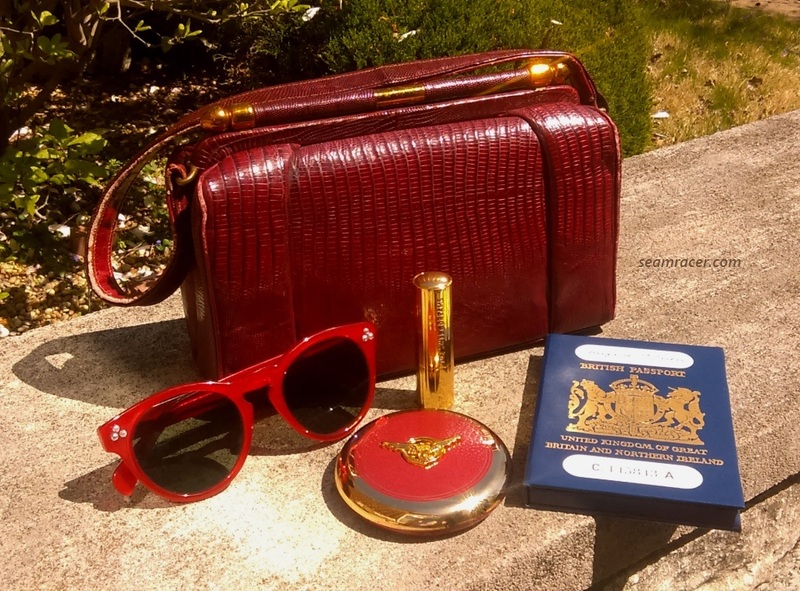 It’s the perfect opportunity to go all out vintage in and out. 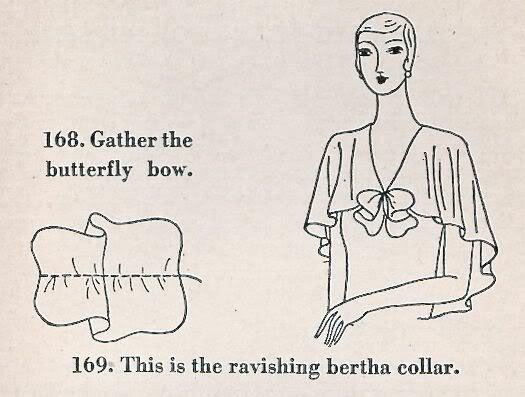 The shawl collar was the 3rd part of my re-fashion. The pattern I was basing my shawl collar on actually reminds me of “Superman”. It is the type of shawl which starts on the left shoulder, drapes across above bust length in the front, but comes all the way down the back and gets sewn under to the back bottom hem. This design had to be adapted and re-drawn. 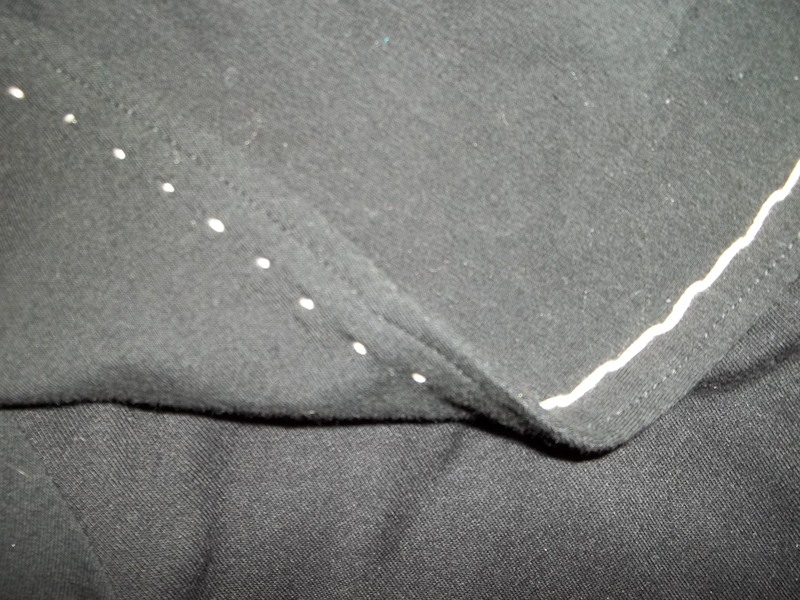 I began by pinning together the small shoulder shaping pleat on the right side of the collar pattern. 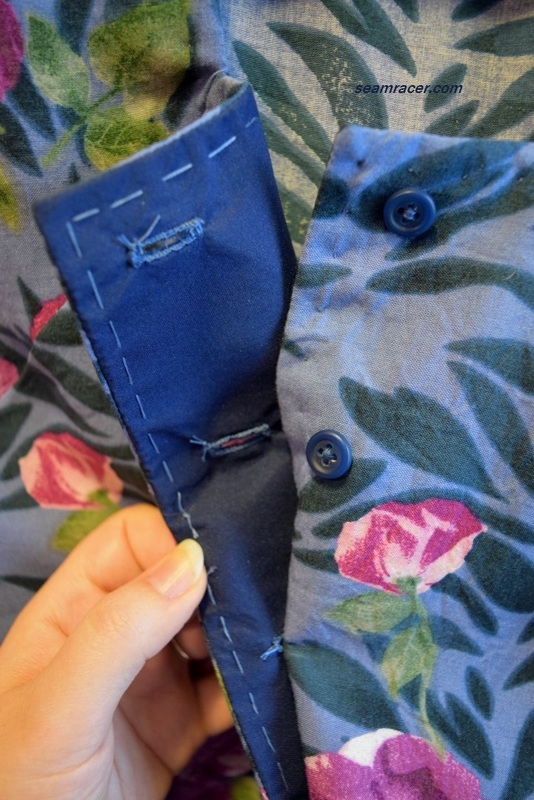 Next, I folded the collar pattern in half at the shoulders so I could trace the shape of the front collar onto the back half (see picture at left). Technically I made the back just a little lower hanging than the front, but I did dip the center front down lower to make sure it would cover the open neck of the dress. Besides re-drawing the pattern I further adapted it by double layering the shawl collar. The instruction sheet merely says to do one layer and make a tiny hem on the edge, which sounds great for a chiffon or something lightweight. 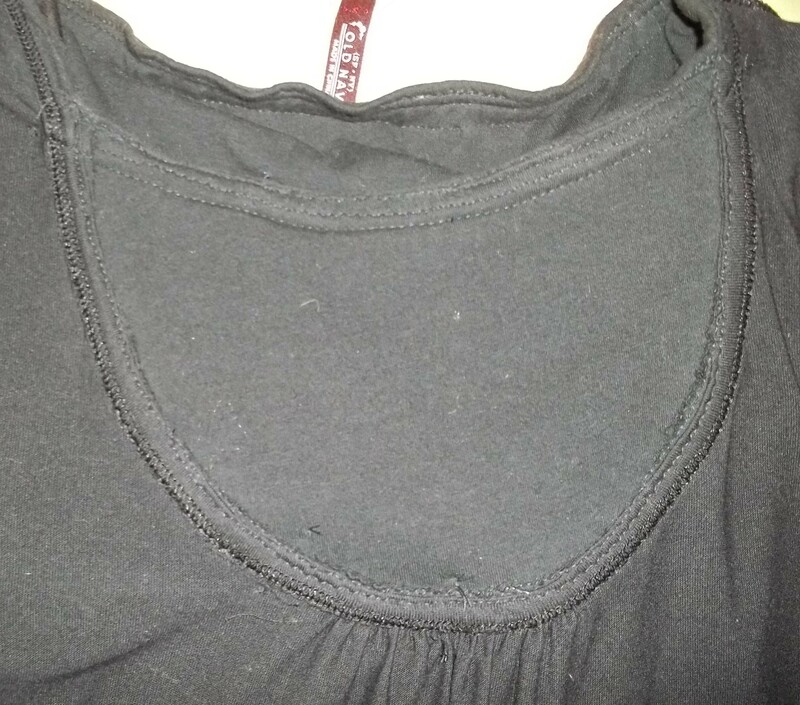 However, I knew one layer of my knit would make a flimsy collar, nor did I want: 1) a raw edge hem too be that obvious, 2) a collar which would stick to my dress or blow in my face. So I cut out two collar pieces (which were quite large), sewed the front pleats and the left shoulder seams (the only shoulder seam), and sewed the collar pieces with right sides together along the outside edge. Now the collar could be turned right sides out and there was a clean seam along the outside edge, ready to be top stitched, and later hand decorated. 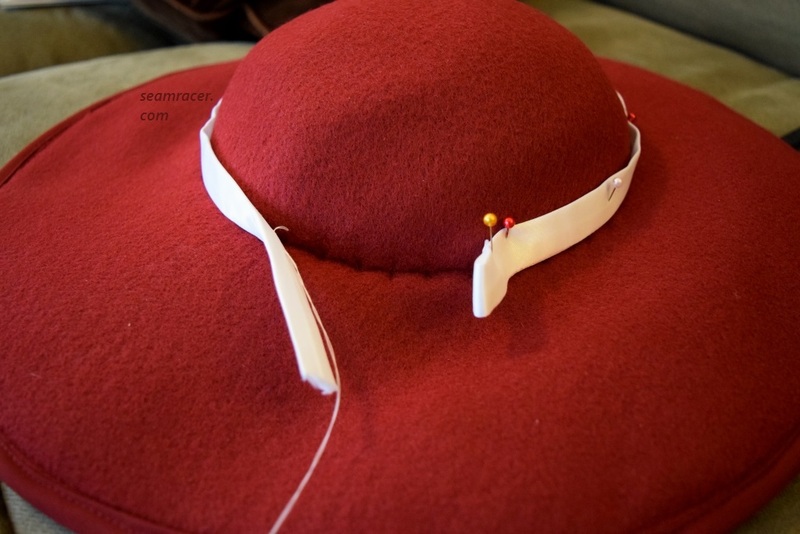 The collar’s inner neckline edge was then pinned together, as well as under, so it could get sewn down to the dress finally. I realized I needed to draft something to fill in the low, plunging U neckline on the original dress (finished inside picture at left). I had been waiting to do this step until the collar was done so I could measure everything and get as exact as possible. I put the dress on, then placed the collar over myself, pinning at the shoulders. The back of the collar seemed to match up exactly with the back neckline of the dress. 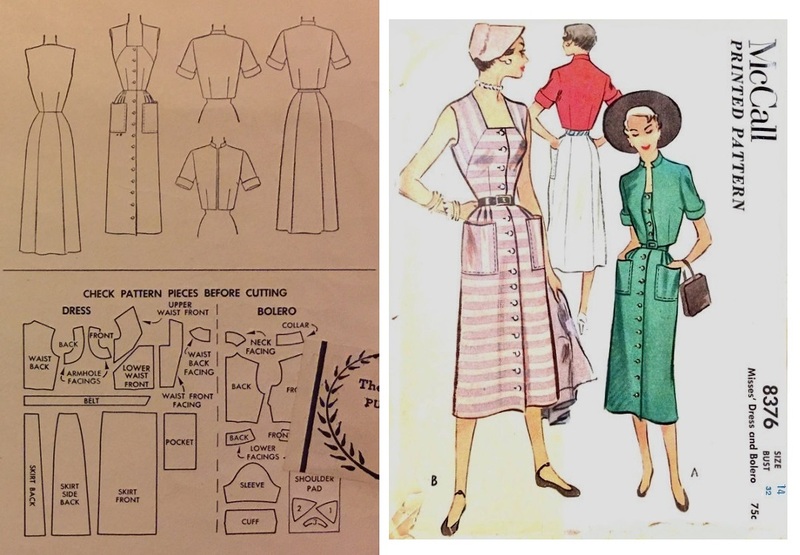 For the front, I measured the difference from the collar neckline down to the dress neckline and traced out the scoop neckline shape on the collar with white chalk. 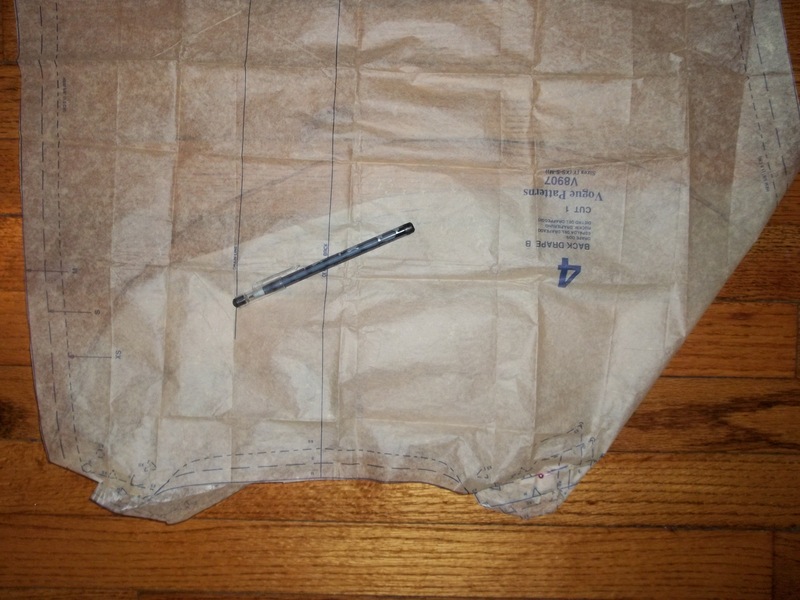 After both items were off of me, I got out paper, stuck it inside the neckline of the dress as it was all laid out nicely on the floor, and began to trace out a filler neckline. When I was done with my drawing, I compared it to the shape that was chalked out on the front collar, made some minor adjustments, and added seam allowances before it was cut out. 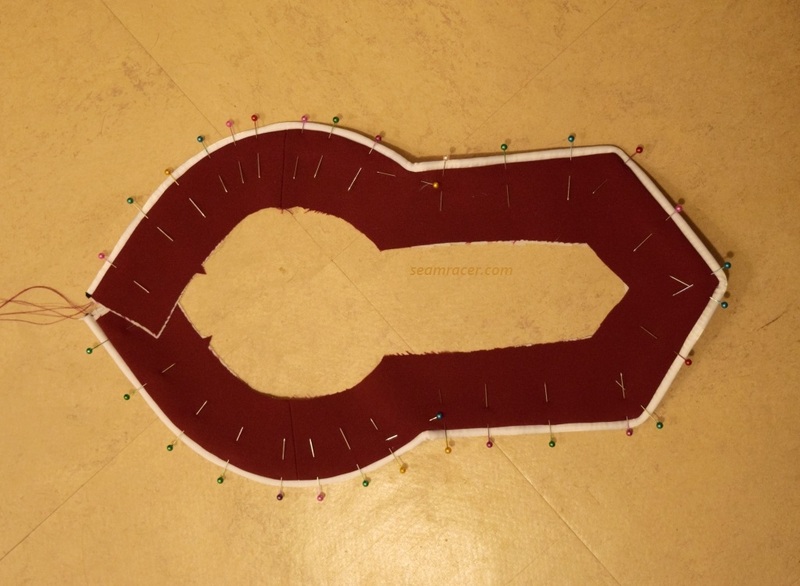 Once I had the fabric cut out in the shape of my neck filler, I turned the edges in, towards the right side, since I lapped the neckline line piece under the original neckline. With the neckline ready, I turned in the neck edge of the shawl collar, and sort of lapped the neck and collar together in a stable double seam. My stitching along the edge was a fun and relaxing thing I got done one Saturday afternoon. (See close-up at left) Every so often I do decorative hand-stitching techniques, and I feel I did quite a good job here doing even widths and choosing the right stitch. 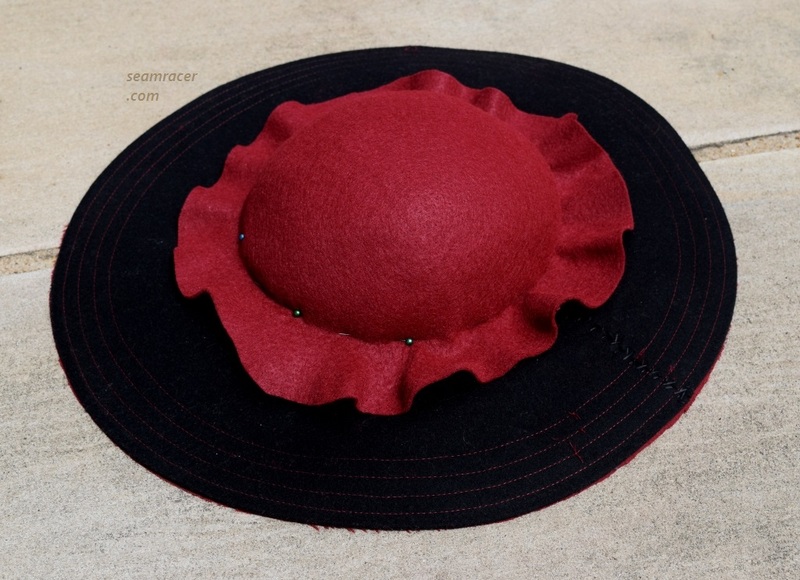 The bow, all ready sewn in it’s shape, added a perfect last touch. 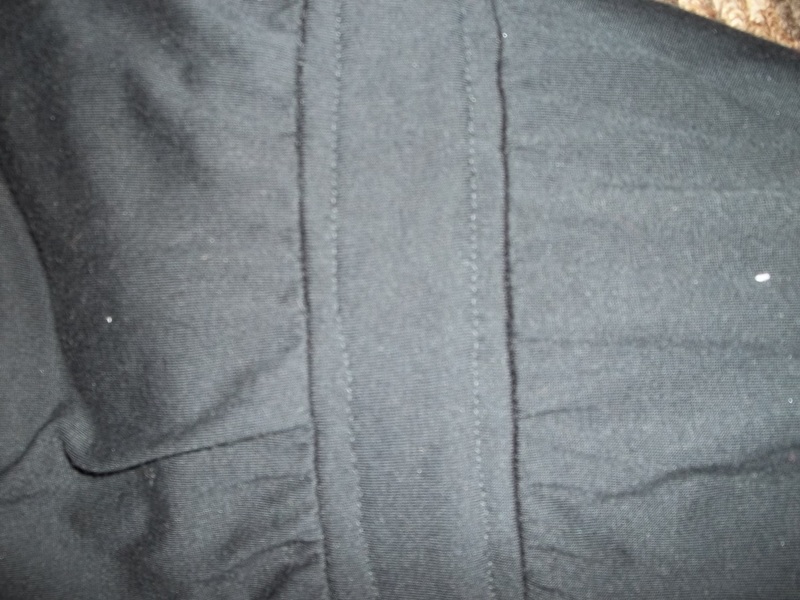 It is sewn down just on the front side of the left shoulder seam. 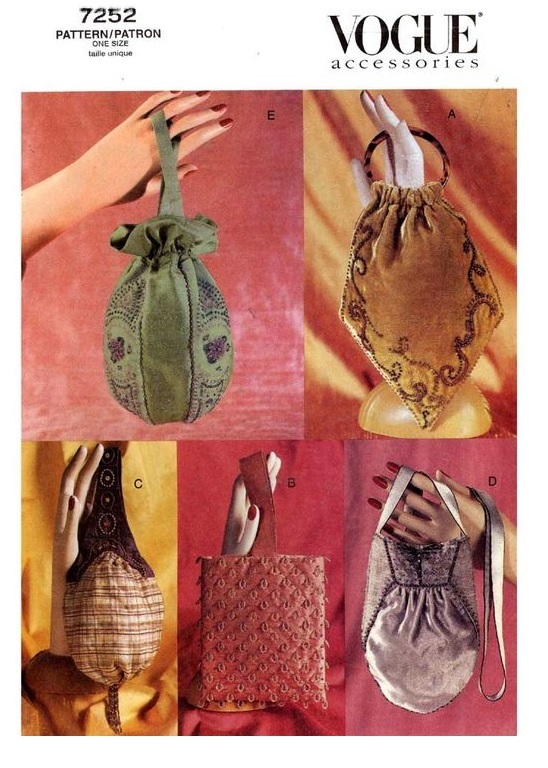 The old McCall 5313 envelope cover picture at far left shows a bow finishing off a sheer shawl collared dress. One of my favorite movies, “Manhattan Tower”, from 1932, has the secretary character Mary wearing a large scarf bow on her left shoulder, too. See it for yourself, here, at about the 5:30 time counter, then go ahead and watch the whole movie yourself at some point – it’s quite interesting. 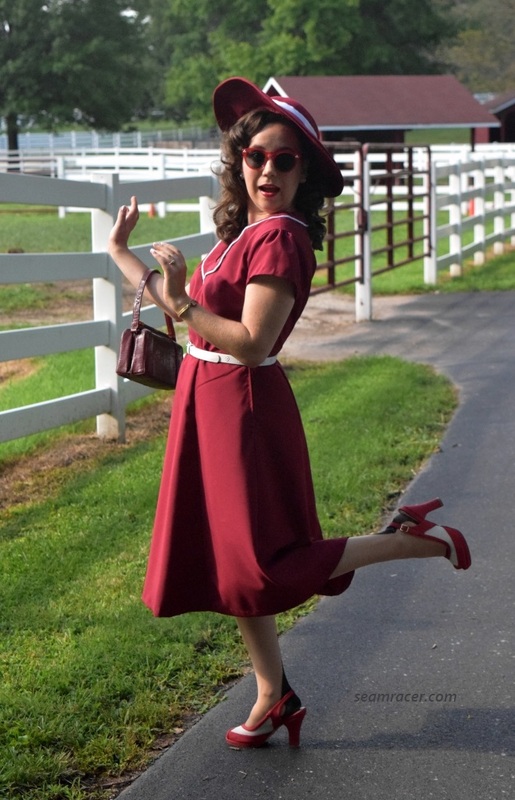 Originally, my main inspiration and idea for making this dress came from and outfit worn by the character Peppy Miller from the 2012 movie “The Artist”. 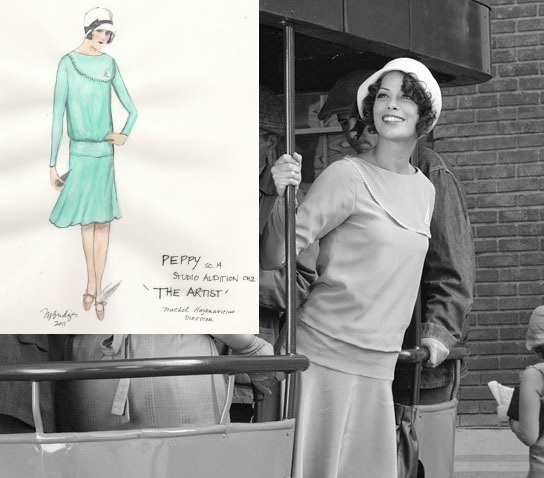 Peppy wears two different types of shawl/cape collar dresses in the movie, but the one that inspired my sewing can be seen in the combo of movie still/costume drawing at right. 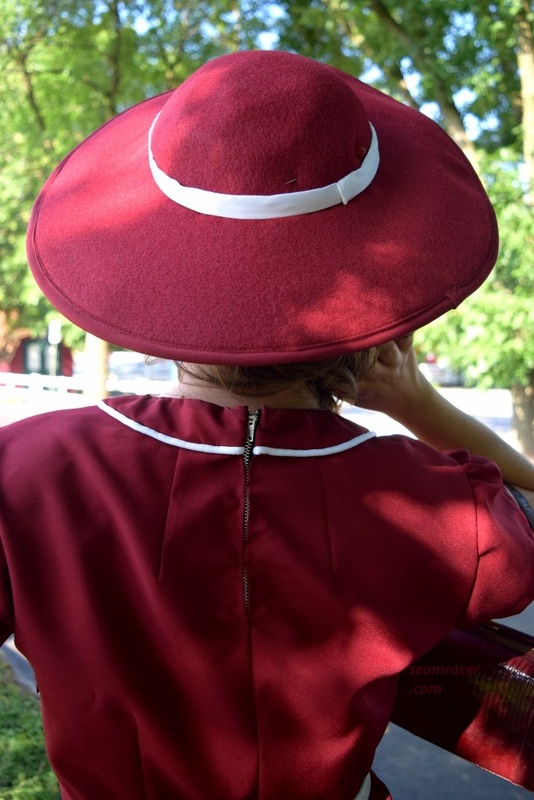 Her dress was worn towards the movie’s beginning, the day after she makes headlines, and she is getting off a trolley car to try for a job as a movie extra. Looking closely at the movie dress, I began to see a few ways to make my interpretation closer to historically authentic. 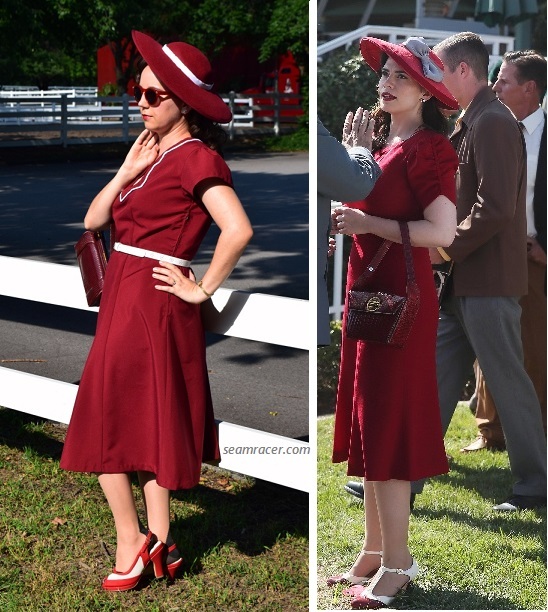 This is the second “The Artist” movie inspired dress I have made recently, the first can be seen here. I plan on making two more dresses from the movie as well. 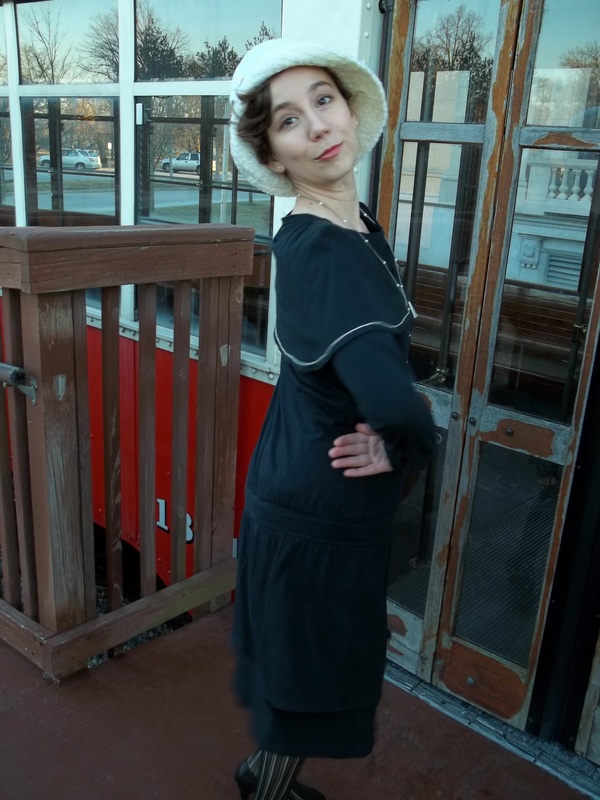 In honor of “The Artist”, we still HAD to take our photo shoot at an old trolley car in front of our town’s History Museum. I’d like to put a few captions to the pictures below. Hubby caught me doing a ‘Peppy Miller’ dance when he snapped this one. 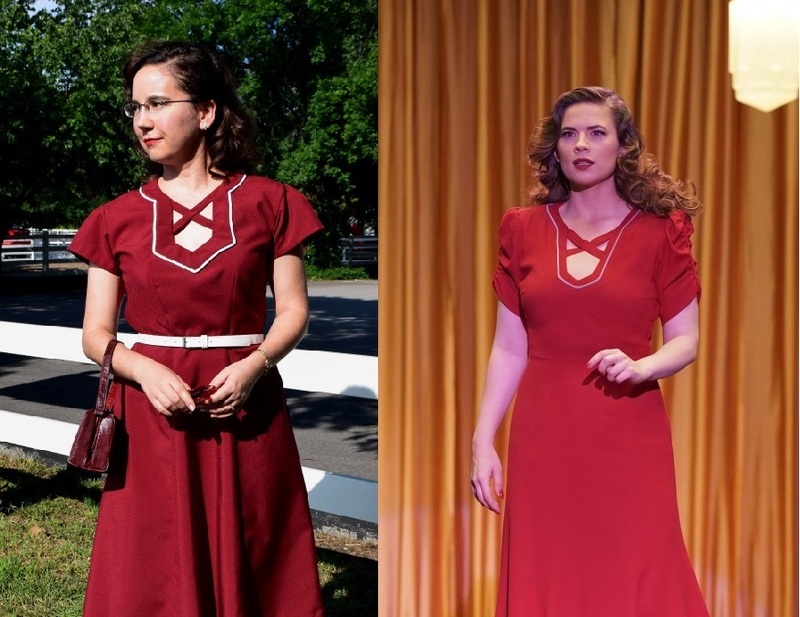 Both pictures, while fun, also show how nicely my shawl collar lays. Hubby seems to think the collar, together with everything about the dress, has a modern, fashion forward look. All I know is I love wearing my dress! It’s incredibly comfy, fun, and I feel like it has a classiness that isn’t trying too hard. 20’s meets modern in so many ways with this new dress of mine. Talk about getting a “leg up” on fashion. I have to let you go…I need to catch this trolley. However, the ‘trolley car’ of innovations in the world of fashion never stops and always keeps rolling on, changing what we wear and how we wear it. 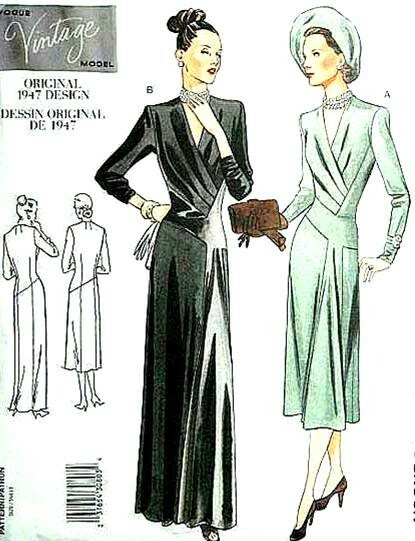 At the same time, when I make something like this 20’s shawl collar re-fashioned dress, I tend to think that some things just never change.